Here's is a wonderful take on the King Fish, also known locally as Surmai. This is a large fish and the flesh is very meaty. 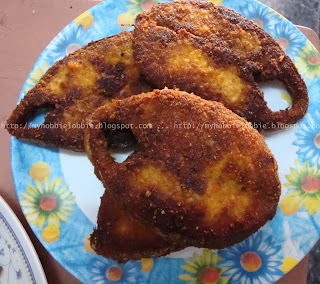 I simply crumb fry the slices of fish after marinating it in some spices. Nothing can be simpler. The marinade is not complex and the process is simple. So the next time you have some fresh king fish, give this a try. Along with the crunch you get from the crumbs and the meaty flesh, you can also taste the subtle flavors of the marinade and they come together beautifully. Serve this with a nice fresh salad and some bread and you have a lovely light meal. Traditionally, this would be served with some Goan Fish Curry and Rice or some wonderful Dal (Lentils) and Rice. I will get posts up on those as well. But for now, enjoy this recipe. Please note that these quantities are just a guide. Feel free to adjust them to your liking. Also, quantities will depend on size of the slices of fish. Sprinkle the salt, lemon juice, apple cider vinegar, turmeric powder, chilly powder and besan on both the sides of the slices of fish and gently rub it over to spread it onto the slices. You may need to add a few drops of water to help you with this process. Please be gentle, you don't want to break the slices. Keep aside for atleast 15 minutes. Dredge the slices of fish in the bread crumbs to coat well. Carefully place the slices in the pan and let it cook on a medium flame till it has browned on one side. Flip over gently and cook the other side as well, adding more oil to the pan, if needed. Make sure you cook it on a medium flame and not a high one. A high flame will simple brown the outside, but leave the insides raw. Also, its best to have thinner slice of fish than thicker, they will cook faster. This fish looks crispy and dleicious. so crispy and delicious !! Thanks everyone ... Sanyukta, hope to see you back soon! This sounds wonderful! Thanks for sharing your recipe with the Hearth and Soul Hop. Thanks for stopping by Alea!!! I'm not sure if I can get King Fish here in England, but your marinade and crumbs sound just delicious. I can think of many other fish I could use it on! Thank you so much for sharing it with the Hearth and Soul blog hop. You're absolutely right, this goes well with almost all kinds of fish!